Hailing the “long and proud” history of United Nations peacekeeping — with over one million “blue helmets” having served in more than 70 operations on four continents since 1948 — Secretary-General Ban Ki-moon led the Organization today in honouring those men and women who lost their lives in the past year, while looking to the future, envisioning a modern, global force that can effectively tackle emerging peace and security challenges. 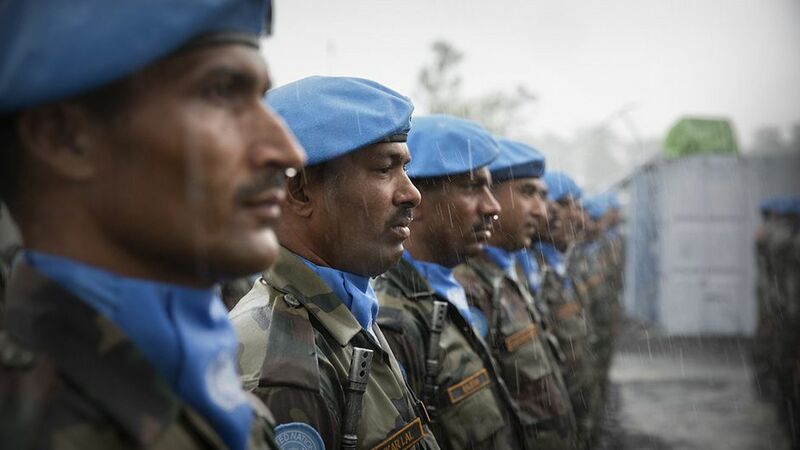 On this International Day of United Nations Peacekeepers, observed annually on 29 May, the world body honoured the 106 peacekeepers who died last year while serving under the UN flag, bringing the total number of lives lost in the history of peacekeeping to more than 3,200. Opening a solemn wreath-laying ceremony for the 106 peacekeepers who died in the past year, UN Secretary-General Ban Ki-moon said 2013 was the sixth year in a row that more than 100 peacekeepers died. The annual wreath-laying ceremony took place for the first time at a newly-created site on the north end of the UN’s New York Headquarters complex. Opening that solemn ceremony, Mr. Ban said 2013 was the sixth year in a row that more than 100 peacekeepers died. Some were killed when their convoys came under attack in Darfur and South Sudan. Others had lost their lives to explosions in Mali. Still others were taken by floodwaters in Darfur. “In the Democratic Republic of the Congo (DRC) and elsewhere, our peacekeepers were shot while protecting civilians,” he said, adding that in the Middle East, Haiti and beyond, many succumbed to deadly diseases and other dangers that are part of their life-saving work. “The threats continue this year. 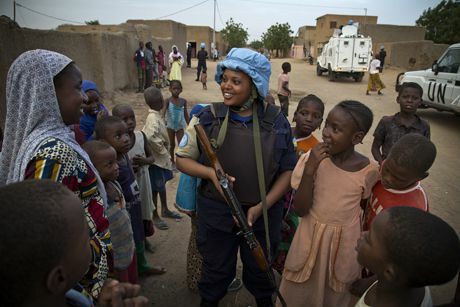 The insecurity in South Sudan, the Central African Republic, Mali and Darfur has tested us to the limits of our capacities,” the Secretary-General said, underscoring that the Organization is doing everything possible to protect its personnel in the field. “Despite our best efforts, we can never reduce the risks entirely,” he added sombrely. “By rapidly erecting protection of civilian sites for 90,000 civilians fleeing war in South Sudan — sometimes from an empty plot of land — we have shown that we are able to adapt under tough circumstances to respond to developing crisis,” said Mr. Ladsous, adding that by going after armed groups in the foothills of North Kivu with ferocity and vigour, UN peacekeeping has shown that it “will not back down” when confronted by those who would threaten the most vulnerable. “Of course, none of this would happen without the support of our partners. Today, I would like especially to commend the Member States, who provide troops and police, resources and funding, training and equipment — our contributing States. I thank you all for your hard work on our behalf,” he said. As for current on-the-ground operations, UN peacekeeping is providing a dynamic response in some of the planet’s most complicated and difficult places, said Hervé Ladsous, Under-Secretary-General for UN Peacekeeping Operations. Under-Secretary-General for Field Support, Ms. Ameerah Haq said that 22 civilians had been among those who lost their lives while serving in UN peacekeeping missions, including in Liberia, Darfur, and South Sudan. On behalf of the Secretary-General and the Departments of Peacekeeping Operations and Field Support, she extended deepest condolences to the families and loved ones of the deceased. “Our civilian colleagues in the field toil day-in, day-out on the frontlines of today’s conflicts,” she said noting that whether mediating inter-tribal conflicts, documenting human rights violations, or reporting on the state of fragile ceasefire agreements, they carry out their work at great personal risk and sacrifice. Mr. Ban said earlier that UN peacekeeping is modernizing to ensure that it can tackle tomorrow’s peace and security challenges. It is deploying new technologies such as refining its practices to better protect civilians, and boosting the representation of women among its ranks while strengthening its partnerships with regional organizations. He noted that over the past year, the Security Council established two peacekeeping operations — in Mali and in the Central African Republic — again highlighting its trust in UN peacekeepers to take on tough challenges. 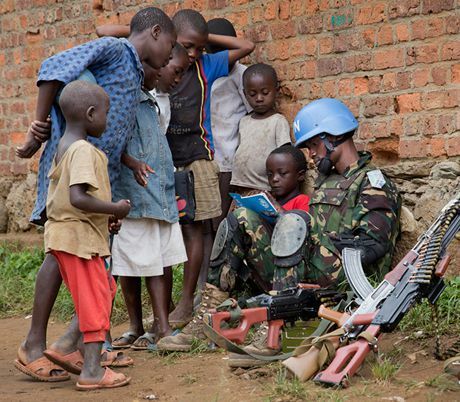 Photo: MONUSCO Photos. Creative Commons BY-NC-ND (cropped). Earlier this month, the Security Council established the “Captain Mbaye Diagne Medal,” named after an unarmed Senegalese peacekeeper who lost his own life after saving as many as a thousand people during the 1994 genocide in Rwanda. “This medal will honour UN personnel who demonstrate exceptional courage. Let us all commit to following the selfless example of Mbaye Diagne and other fallen heroes, as we work together to help our blue helmets be a force for peace, a force for change, and a force for the future,” declared the Secretary-General. “We must ensure that security challenges are addressed in the countries where peacekeepers work so that we can create a more sustainable future for all members of the international community,” he said. As the UN and the international community continue the global effort to set the stage for the creation of a post-2015 development agenda, innovation and technology, especially the transfer of new and emerging technologies will greatly contribute to strengthening global security. “We must continue to create new ways of using these technologies to protect those at greatest risk in conflict and war-torn countries,” said Mr. Ashe.